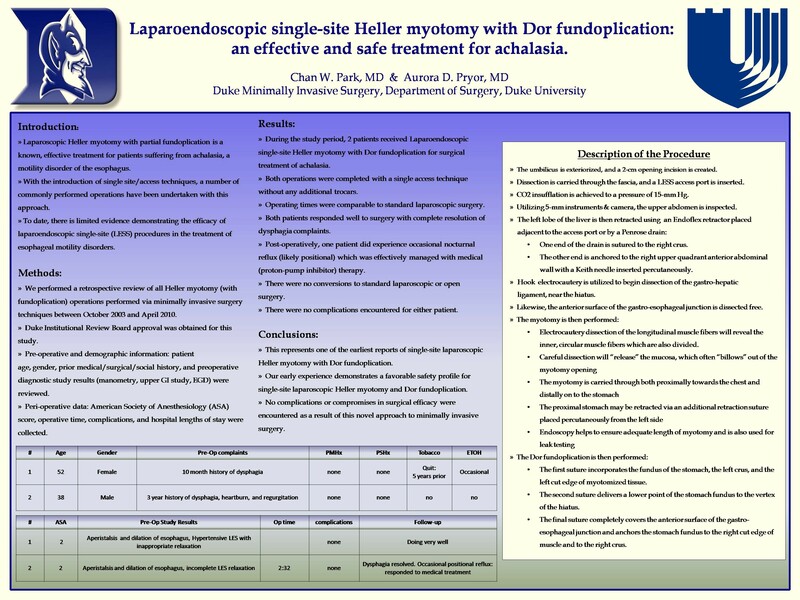 Laparoscopic Heller myotomy with partial fundoplication is a known effective treatment for patients suffering from achalasia, a motility disorder of the esophagus. With the introduction of single site/access techniques, a number of commonly performed operations have been undertaken with this approach. To date, there is limited evidence demonstrating the efficacy of this procedure in the treatment of esophageal motility disorders. We report our early experience with this novel approach to minimally invasive surgery in 2 patients who were surgically treated for achalasia. Both operations were completed with a single access technique with no additional trocars, and operating times were comparable to standard laparoscopic surgery. Both patients responded well to surgery with complete resolution of dysphagia complaints. Post-operatively, one patient did experience occasional nocturnal reflux (likely positional) which was effectively managed with proton-pump inhibitory therapy. There were no complications encountered for both patients. Although further studies and more robust data are necessary, our early experience demonstrates a favorable safety profile for single site/access laparoscopic Heller myotomy and Dor fundoplication. No complications or compromises in surgical efficacy were encountered as a result of this novel approach to minimally invasive surgery.